Berkeley’s City Council passed a new demolition law that no one really likes. There is already talk about making a better one. This one allows destruction of rent controlled units if developers pay a fee to mitigate the loss of rent control, since the state law Costa Hawkins won’t allow any rent control of new buildings. However, the City Council is waiting until After the Election to set the fee! The City Council also approved demolition of the building on Durant, under the new law, which is great If the Fee Allows For One-for-One Replacement. The decision was remanded to the Zoning Board and will be heard February 25, 2016. Efforts to change the demolition ordinance in 2013 faltered after the city became aware of a pending court case on inclusionary housing. Although the 2015 California Supreme Court decision does not apply to rental units, the decision does give more latitude to municipalities to charge impact and mitigation fees. Now the City has gotten back results of a New Nexus Study to set fees. 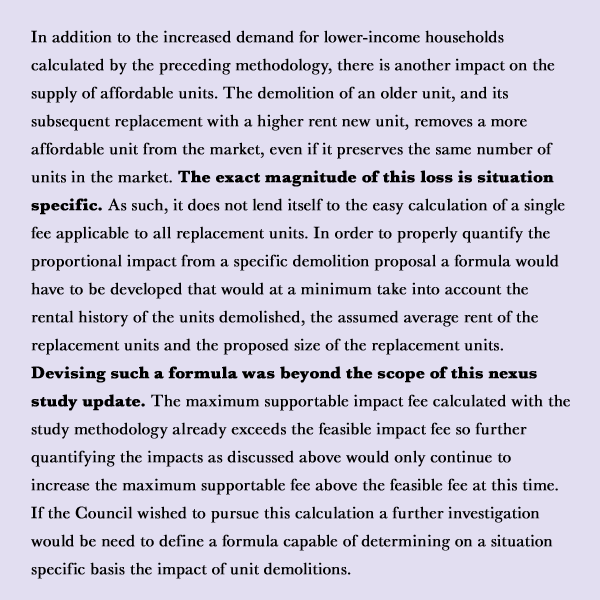 Please note the study itself says that quantifying demolition of rent controlled housing should be done on a case-by-case basis – but staff are calling to change the law and set a fee for demolished units that will only capture the impact of new expensive units on the need for affordable housing and NOT cover mitigation of the loss of the affordable units caused by the demolition itself. 2) The number of units could no longer be verified because the developer invited the Fire Department to practice in the building and that led to removal of all the walls. We are appealing the decision to Council, and the students of UC Berkeley (ASUC) have joined us in that appeal – and the developer has also appealed! Meanwhile, as the staff report on the Nexus study hints, the City Council wants to set a flat fee for very little money to allow demolition of rent controlled units. This will literally pave the way for expensive condos and commuter apartments, displacing long-time residents with predictable rents. There can be no rent control on these new buildings per state law. The fee proposed in the Nexus is a big step away from the one-for-one replacement of each rent controlled unit with permanently affordable housing that the community called for in 2013. See letters from NAACP, Sierra Club, BAHA, and many other Civic Groups posted on this page in 2013 (below). The impact if the City Council upholds the ZAB decision allowing unverified math to determine that the developer can’t get a fair rate of return, coupled with a flat fee for demolition, could see practically anything in Berkeley torn down simply to build fancy new units. The Berkeley City Council is considering revisions to the Demolition Ordinance which would make it easy to tear down rent controlled apartments – and any other building in Berkeley! In June 2013, a compromise draft of revisions to the existing Demolition law (BMC23C.08) went to the City Council. Since then, each new draft of the law is worse for Berkeley, and Berkeley tenants in particular, than the last. The Sierra Club, NAACP, Neighborhoods Council, Berkeley Architectural Heritage Assn. and East Bay Community Law Center are also speaking out against these new drafts. BTU asks that any change require one-for-one replacement of rent controlled housing with units affordable to low income residents – The Housing Advisory Committee and the Berkeley Rent Board agree. Email us at info at berkeley tenants dot org to help with this campaign.